Home » Training at home, how to structure a successful training session. Structuring a successful training session. Much of the training you do at home will occur during every day contact with your puppy. For example, when your puppy jumps up, you should turn your back, fold your arms and reward him/her with attention only when all four of his/her feet are on the floor. Be conscious of all your interactions with your puppy. Make an effort to reward behaviour you like and avoid rewarding behaviour you do not like. Additionally, devoting a few minutes a day to a training session is invaluable. Many of the techniques taught in class require you to develop new skills, such as timing, reading your puppy and simultaneously juggling treats and a lead. The ultimate target, besides a better-behaved puppy, is for you and your puppy to learn to communicate effectively. Training sessions allow you and your puppy to focus exclusively on each other. Develop a routine of at least one short training session per day. The treat is only the lure or the incentive, not the reward. The reward is you, the words you use, such as, “good boy/girl”, eye contact and gentle contact stroking on the neck/head. Say your praise words quietly, but clearly, make your puppy listen to you, but mean it, convey to your puppy that you really appreciate what it has done for you. This way your puppy will react quickly because it wants to earn your praise. • One trainer and one puppy at a time. Children should be supervised to ensure that they fully understand what is required, what is being attempted and the techniques needed for success. • Be prepared. Have your treats, such as soft stinky treats ready and decide what you are going to work on before you begin. • Set your puppy up to win. Progress comes from building on success. • If your puppy appears not to understand what is expected or what you are trying to achieve,” change something you are doing. • Keep it short, keep it happy and always end on a successful and positive note. A session that ends with both of you happy is a successful session. Find a place to train where you and your puppy can be alone. Spectators, such as other members of the family are only allowed if they promise to sit down and be quiet. 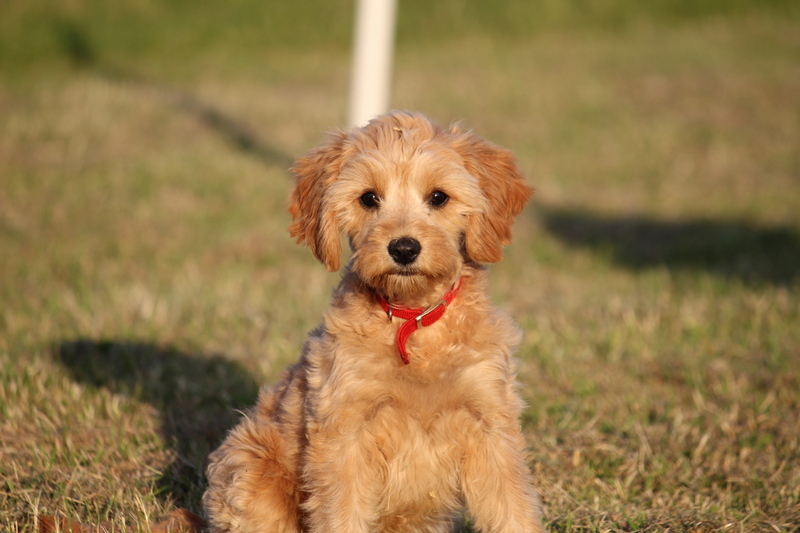 Other puppies or pets in your home should be kept outside the training area. Get your treats ready. Positive reinforcement methods require positive reinforcements. Treats should be small, soft and something your puppy is willing to work for. You can put treats in a bowl on a table; put them in your pocket or in a waist bag. Pick a few obedience positions to work on before you begin. Help your puppy choose the position you want, by luring or by limiting his/her choices, and reward him/her when he/she gets it right. He/she cannot succeed if you are not clear in your own mind on what you want. For your next training session, pick different obedience exercises to work on, keep changing the routine. This keeps it interesting for both you and your puppy. Avoid making training sessions into repetitive exercise drills. Set your puppy up to win. In the early stages of training treat frequently to keep your puppy interested in the game, the learning comes when he/she is getting it right. If you do not get an opportunity to reward and treat within 30 seconds or a minute, change the obedience exercise. Then assess what is wrong (see below) and try to fix it. Repeated failures, such as when your puppy is not responding to your first cue, may establish a pattern in the pup’s mind of behaviour you do not want. Keep it short, keep it happy and always end on a high note. A good training session has a beginning, middle and an end. Begin with a few exercises your puppy already knows, so you can reward and give a treat straight away. Then spend a few minutes on a new exercise or improving an old one. End the session on a success; go back to an easy obedience position if you need to – then give a big reward and let your puppy know the session is over. Following a training session with play, a meal or a walk is a nice plus. The whole session may only last less than 5 minutes – do not keep going so long that your puppy loses interest in the training. A tiny amount of progress in any individual session is all you need. Add up all the tiny steps and you will soon see very big changes. If you are getting frustrated, try again later continuing will do more harm than good. What is most important is that both you and your puppy enjoy the process, so you are motivated to train again the next day. Does your puppy seem anxious, confused or disinterested? • If anxious, do not lean over your puppy; use a softer tone of voice. • If confused, make sure you reward immediately you have the success you are attempting to achieve and that you reward for the same behaviour each time. • If disinterested, try better/different treats or in a place with fewer distractions. Have you recently fed your puppy and therefore he/she is not hungry? Another possibility is that you need to improve your timing. Once your puppy understands this is a game worth winning, he/she will be interested.